This recipe of steamed buns comes late, a bit behind my original schedule. 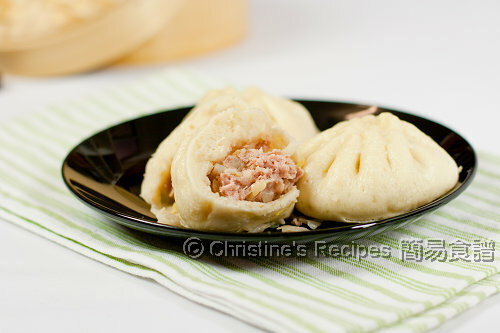 These pork buns were cooked last week and posted on my Chinese food blog a few days ago. Over the past few days, south-east Queensland has experienced a very devastating flood, so called “inland tsunami”, similar to 1974 tragedy. The family was spared as we are not in the flood zone. Sadly, countless suburbs, the CBD of Brisbane and Ipswich are inundated, awaiting for clean up once the flood waters are clear. My mind was totally occupied by all those images and news about the flood through the media. It’s so sad to see many people lost their houses, their business, their property and even their loved ones. I’ve ever seen such a horrible flash flood since I moved to Australia. Hope I won’t see any again. My thoughts and hearts are out to all those affected in this traumatic flood. The flood came so quickly, much quicker than anyone expected. So, be thankful and enjoy what you have right now. Even if it’s something as simple as eating a few buns, it's a bliss by itself. Speaking about the buns, they can be kept in freezer for up to two to three weeks once they are steamed and cooled down. I usually take one or two out form the freezer, needless to defrost, and quickly bring their softness and freshness back by steaming in a wok/steamer for breakfasts. Mix pork with seasonings well. Chill in fridge for about 15 to 20 minutes. Combine pork with cabbage. Set aside. Use a measure cup or a bowl, pour in milk. Add ½ teaspoon of sugar and yeast. Rest for about 5 to 10, until bubbles arise. Combine flour, 1½ teaspoon of sugar, water, oil and yeast mixture, knead into a smooth dough. Place the dough in a bowl, covered with a cling film. Let rest for 15 to 20 minutes. Transfer the dough onto a clean surface. Cut into 10 equal portions. Shape each in round balls, then roll into a disc with a rolling pin, with edges thinner than the middle. Wrap a spoonful filling inside, pinch seam tightly. Place on a piece of baking paper. Repeat this step with the rest of the dough. Transfer to a steamer/wok, covered, let rest for about 15 to 20 minutes. Add cold water into steamer/wok. Steam buns over medium-high heat. When steam is vigorously releasing, continue to steam for 12 minutes. Turn off the heat, let rest for 10 to 15 minutes. Serve hot. You can substitute with other vegetables, like baby bok choy, chive, or any vegetables you like. 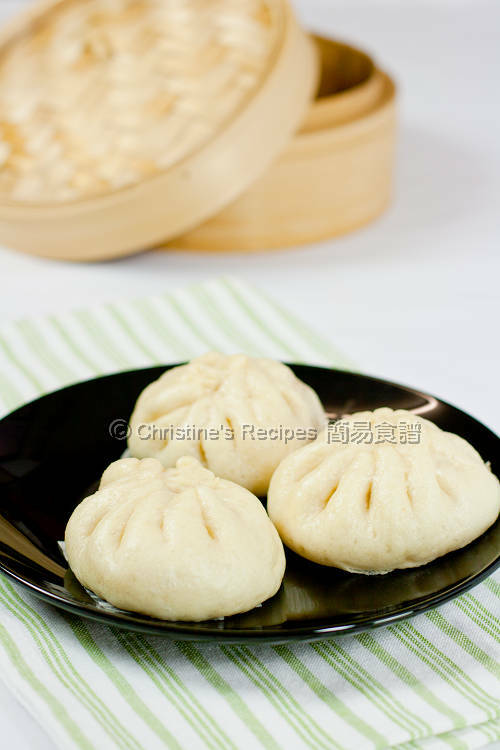 The buns you steamed might look a bit yellowish if you use ordinary flour. Except you use the bleached flour, then your buns would look as white as those bought from shops. But I used the ordinary, unbleached flour, and made it whiter by adding some milk in the process of making the dough. So the buns shown in this post were quite white. If you use only milk without any water to make buns, they’d look even whiter. As I don’t want these Chinese buns taste heavy milk flavour, I just incorporated water to milk, with a ratio of 1:1. You can adjust the ratio according to your preference. You can skip the milk if you don’t like, of course. Just replace it with the same amount of water. That’s easy. Please refer to this post on how to wrap Chinese buns with video shown. heard about the horror flood too. didnt know that you were staying near there. that reminds us again to be thankful and be appreciative with what we are now. You can pleat the paus very well, mine is horrible. I just cant be twisting and pleating them neatly. Thanks for an excellent recipe for steamed buns! They look really delicious, I would love to make them sometime soon! Mmm I love these baozi. My parents tried to make these when I was very young, but I think they failed because they used self-rising flour. Now that I know something about cooking for myself I may have to finally do these the right way :). Yea the rain has been terrible in victoria as well. some areas are flooded too. We will keep praying for those affected. Nice looking steamed buns christine. the bao looks so nice, I am craving for one now. Thx for sharing, love your cooking! excellent recipe! I will try this one out asap. I like it since NO shortening is required. yay! may we all thank god we can use our kitchens to make such lovely food for our families. Blessings to all affected by the floods . Thanks for all your wonderful recipes . Yes, We are blessed to have what we have and lets not forget to pray for those who are less fortunate than us. I am glad to hear you are not affected, but living so close to the area, I can feel for you. I often put a few drops of vinegar into the hot water when steaming the buns, that whiten the bun's colour a bit. see if that works for you next time. These buns might be simple, but they are definitely delicious and comforting. Wow...beautifully wrapped buns. I just had some awesome meat buns the other day....given by a friend. Love the plaiting of your steamed buns. So neat!! I am yet to master it. I have always wanted to make pork buns but it seemed too daunting! thanks for the recipe! now im going to have to give it a go! Can I know how long you knead the dough till it doesnt sticky? This one...not very long, only 10 minutes or so. When the surface is smooth, and not sticky, it's done. Is the milk the trick to a lighter coloured dough? My mum never adds milk when making her dough and it turns out slightly yellow when steamed. I made these pork buns the other day and it came out great! The filling was so tasty! I just need to master the plaiting..then it'll be perfect!! I am a massive fan of your blog and I've tried out quite a few recipes and it's all been a success! I want to thank you for sharing your recipes, it has improved my cooking skill a lot! I'm only 21 years old and I'm quite surprised how simple it is to cook these yummy foods! The regular flour is a bit yellow, that's why buns are yellow after steaming. The milk can help whiten a bit, not as white as those bought from shops though. Oh, thanks so much for your love of my blog. Good to start learning to cook from a young age, you're going to be a great cook. Yes, many delicious dishes are simple and easy, not that difficult as we thought. Thanks. I will pass this milk-whitening trick to my mum. I really like your blog - I find many of your recipes useful and it makes me think of my home town in Hong Kong. Thanks for your love of my recipes. Hope your mum finds the trick helpful. Same here, really miss the yummy foods of my home town, Hong Kong. Greetings from Auckland! My heart goes out to those affected by the floods, and I'm glad you and your family are safe. Thanks for your generosity in sharing your recipes - really love your great and user friendly blog. Great to have your concerns and thoughts. Btw, you might like to subscribe to my blog, then you won't miss any updates. Hi. Thx for posting your recipe - have been following your blog for a while now & just lurking.... But is the recipe really only 200gm of flour? I found the flour mixture to be very wet esp. since adding the 1/3c milk & water each. Did have to add approx. 1/2C (more or less) of flour prior to kneading it. The dough was rather good... I had my own meat mixture... but this was a rather nice reminder as I am no longer in S.Cali. Hi Christine! Thanks for tue recipe!!! It looks great! Just wondering, did you use your bread machine to knead the dough? If so, did you still knead it for 10mins? I'm afraid of over kneading! Thank you!!! For making these buns, I didn't use my breadmaker, I kneaded by hand. You can use breadmaker anyway. If you use breadmaker, it could take shorter time, could be 5 to 7 minutes or so. It depends on how well your breadmaker performs. I don't take time usually, just test by sight. 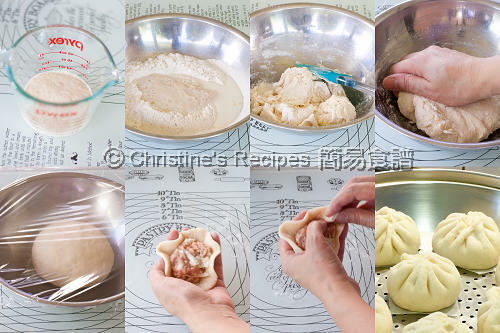 For making chinese buns, if you see your dough coming together into a ball shape, not sticky on the surface, not leaving any bits of paste in your machine, not stick to your hands, then you get the sign that your dough is kneaded enough and ready. Can you use rice flour instead of regular wheat flour? You can use rice flour. But the texture won't be elastic because rice flour doesn't have gluten. Food 4 tots linked ur pau recipe to me which I tried out yesterday. I used "Bake King" Hong Kong flour instead of plain flour and the dough proofing took about an hr because at 20 mins, my dough did not rise too much. Overall, the paus were OK after steamed. I think I would add a little more sugar the next round cos' sugar. I kept the paus in the fridge for fear the filling might turn bad and paus were hard the next day. In fact, paus were slightly hard during the night before I put into the fridge. Christine are u able to advise me did ur paus turn hard the next day? I had eaten paus which remained soft the following day. R u able to advise how do I achieve or retain softness of pau right up till the following day? Appreciate. This kind of dough only incorporates natural ingredients so we can't expect very soft. The ones bought from shops might've added something to make the buns keep soft for days. Hmmm... your case is interesting. I found the quantity of dry ingredients are ok, the mixture is not too wet. Only added a bit of flour to help shape the dough. Have made buns with this recipe for several times. Did you knead the flour mixture long enough? I love your blog!! All your recipes seems amazing. I tried making these buns yesterday but after steaming it smelled and tasted like yeast. Do you know what might be the cause? Various possible causes that make buns/bread taste like yeast, either add too much yeast/or sugar, or the temperature is too warm, in a result that the dough rises too quickly because the yeast grows too fast and too much. I just wanted to double check, so there is no pre-cooking the pork, the steam cooks it from raw to ready? I was going to prep the pork in the crock pot first but wasn't sure if it's supposed to be cooked during the steaming process or not...? No need to pre-cook the pork. If the buns are steamed for enough time, the pork inside will be cooked through. You can cut open one to see if the pork turns white in colour, then you'll know it's cooked. Can I replace plain flour with pao flour?